In the last post, we covered how the Threat Level system works to provide Dragon Age and AGE system game masters with a base score for deciding if a group of adversaries would make an appropriate challenge for their player characters. This post expands on those rules by providing the Threat Level system for the adversaries found in Open Design’s Midgard Bestiary Vol. 1, which presents fifty new monsters for use with the Adventure Game Engine—the system that powers the Dragon Age RPG. But first, a quick recap is in order. Every adversary from the Midgard Bestiary has been given a Threat Level that corresponds to the average combat scores of different levels of player characters. Those levels are noted on the accompanying table to make it easy to cross-reference a particular monster or adversary with the level of an adventuring party for which the game master is designing a combat encounter. Remember that at-level encounters, or a matchup between a group of adversaries whose Threat Level matches the experience level of a group of player characters, is considered a difficult fight, and one the players will win only about 50 percent of the time. That’s why the table also provides a Threat Rating system, which allows game masters to see at a glance how difficult a fight between a group of players and a group of adversaries is likely to be. The ratings are expressed in four broad terms: Simple, Standard, Dangerous, and Deadly, and they reflect the level to which the adversaries’ combat scores match those of the player characters. For the best results, game masters should be sure to read the first part in this series to better understand the math behind the Threat Level system, so they know how to best apply it to the situation at their individual game table. Sharp-eyed readers no doubt noticed that the table at the end of Part 1 of this article included only one creature with a Threat Level of greater than 5 despite the fact that the table has two higher entries. The truth is that few of the adversaries published in either of the first two Dragon Age boxed sets pose a serious threat to players of 10th level and above. This is not so in the Midgard Bestiary, where several of the included adversaries have Threat Levels ranked either 6 or 6+, which are those that can not only challenge 10th-level characters, but actually stand a chance of ending their adventuring careers. Some of these monsters are so powerful that game masters might want to make an exception to the previous article’s advice about not using solitary creatures against a party of adventurers. 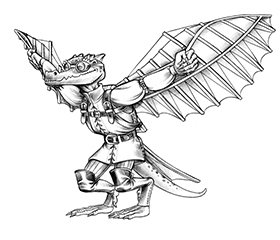 The young cave dragon, for example, not only has powers that can hinder the player characters’ abilities, but it also has attacks that can strike several opponents at once, making it better suited to one-on-four combat. Another good example of this is the Bemmean wizard. The wizard’s Never Alone power is specifically designed to make sure it is a threat even to a group of stalwart heroes, and its spells and abilities are those of a mage above 10th level. As one reviewer mentioned, the Bemmean wizard makes a great recurring villain for a campaign, but be sure the players have the firepower they need to survive when it comes time for the final showdown. It can’t be stressed enough that the Threat Level system is merely a rough guide to help the game master narrow down choices when crafting combat encounters for an adventure. Game masters who keep careful tabs on how easily their players make it through previous encounters will get the most out of the system as they are able to tailor the ratings to the strengths and weaknesses of their group. At the time of this writing, Green Ronin had not released the playtest documents for the game’s third boxed set, which will finalize the rules by providing for character advancement up to 20th level. The Threat Level system will be revised once those rules are released and playtested, because there’s no way of telling how the rules presented in the playtest will change before they are in their final form. As a result, the revised version of these guidelines probably will not come out until after Set 3 is in stores. For now, these guidelines should help game masters prepare for adventures for characters of 1st to 10th level, plus use monsters from both the game’s core products and the Midgard Bestiary Vol. 1 from Open Design. The Set 3 has been release, have you done an upgraded of your THREAT LEVEL system with the monsters of Set 3? Or should we wait till th Dragon Age RPG Corebook it’s in print?